Tomatoes seem ideal for cocktails—they’re brightly colored and vividly flavored—so why do they get used only for Bloody Marys? Tomatoes seem ideal for cocktails—they’re brightly colored and vividly flavored—so why do they get used only for Bloody Marys? In top cocktail bars, kale sees more action than tomatoes. Let’s hope that will change, thanks to intrepid bartenders like Chris McNeill, from Seed Kitchen & Bar, in Marietta, Georgia, who sees a bright future for tomatoes in cocktails. McNeill’s Rickey Tomato is a riff on a classic gin rickey (gin, lime juice and soda water), with the addition of lightly sweet and floral St-Germain, Dolin Blanc vermouth, a touch of sea salt and cherry tomatoes (recipe below). It’s about as far away as you can get from a powerful, spicy Bloody Mary. 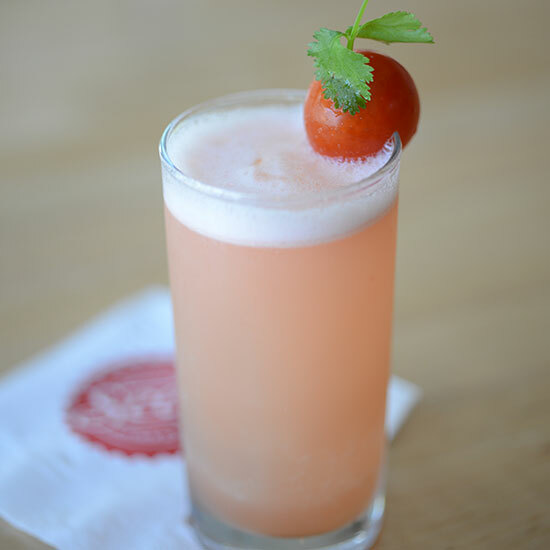 The Tomato Rickey is light, refreshingly acidic and tomato-forward with a slightly salty, savory finish. “It’s a repeat sipper,” says McNeill. Right now, McNeill is working on a follow-up tomato cocktail that draws from sangritas (a mix of tomato, citrus juices and spices served with shots of tequila) and micheladas (a beer spiked with lime juice, spices, hot sauce and, occasionally, tomato juice or paste). His drink will be made with fresh heirloom tomato juice, grapefruit juice, lime juice, orange juice, tobacco, beer and bourbon. It’s set to be a powerful concoction that shows tomato’s more robust side, furthering the argument that tomatoes can be cocktail stars. Muddle the cherry tomatoes in a cocktail tin. Add all of the other ingredients and ice. Shake until chilled and double strain into a glass over fresh ice. Garnish with a cherry tomato and a sprig of cilantro.